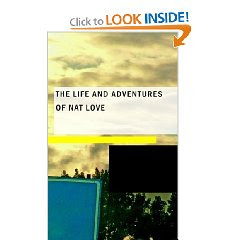 If anyone would like to share some of their favorite nonfiction of 2009, feel free to name a title or two in the comments. I know our bloggers are interested to know what everyone's been reading. In the meantime, the I.N.K. blog will be taking a little holiday break. See you back on January 4, 2010 with brand new posts. During the month of July, each of us is presenting a post from the past. In honor of summer vacation, I have selected my post, originally published in December, 2009, on play and its gradual demise as part of the school day -- and why we should care. May your children and students have some time to catch up on their play this summer! The mother of a 7th grader in Oakland, CA, tells me that morning recess at her son’s middle school has been cut from twenty minutes to ten, and the entire recess, formerly held outdoors, is now limited to an indoor space. Even the theoretical 10 minutes is often whittled down to just a few minutes or none at all because teachers respond to the disruptive in-class behavior of a few students by holding the class through recess to make up for classroom delays. This sorry state of affairs is not limited to the United States. I am just back from speaking at primary (elementary) schools in Australia. I had a few opportunities to interact with children on the playground and I was pleased to notice the great variety of types of play, and how there seemed to be a niche for everyone. Some activities engaged solitary children, others occupied pairs or small groups, and a few involved large numbers. Yet when I shared my approving observations with teachers, I learned that, as in the U.S., recess is an endangered species. Studies consistently prove its value. In one set of experiments from the mid-1990s, researchers found that school children became less and less attentive the longer recess was delayed. Another experimental study found that “fourth-graders were more on-task and less fidgety in the classroom on days when they had had recess, with hyperactive children among those who benefited the most.” An article in the New York Times in February, 2009, cited a study of 11,000 third graders showing that recess mitigates children’s behavioral problems. (Consider the common punishment for misbehaving children: “No recess!”) And a meta-analysis of over 200 studies suggest that physical activity during the school day results in more, and better, mental activity. For all their lip-service to the necessity of drawing on research-based teaching strategies, education authorities in the U.S. and Australia (and probably many other countries) don’t seem to care much about research on play. It is interesting that, by contrast, China launched a nationwide “Sunlight Sport” campaign in 2007, requesting that every school offer one hour of sports and games daily to every student. I read about Chinese children’s play and the Sunshine Sport campaign in a fascinating Australian journal called Play and Folklore, co-edited by Dr. June Factor of the University of Melbourne, an author and folklorist who writes playful and play-filled books for both children and adults. I met June at a reading conference in California about 15 years ago, and I had the good fortune of visiting her in Australia during my recent trip. Quickly, quickly, I feel sickly. Hasten, hasten, get the basin. She kept it in a closet. It left a small deposit. Often, these censorship cases have been dismissed when the schools discovered how many families already owned the challenged books. But what disturbs June more than censors in the libraries is timekeepers on the playgrounds. “Increasingly, playtime is being restricted,” says Australia’s leading observer of playtime. “It’s happening in America and it’s happening here.” In the U.S., where we once feared a “red menace” from Asia, there now seems to be fear that Asian countries including China will overtake us not militarily but intellectually and economically. If it comes to pass, browbeating analysts should consider how our schools rejected the demonstrable benefits of playtime. American education authorities could have the demise of recess to blame for our fall from intellectual eminence. Some might call them drongos! Before e mail, one of the fringe benefits of having my books go out into the world was the mail I received from readers. Young people used to be fanatical letter writers. I looked forward to finding their letters in the mailbox and always enjoyed writing back. I had a two year correspondence once with a teenaged girl in Alaska, until, determined to be a writer, she went off to college. I still wonder if she realized her dream. I do get handwritten letters from children after a class visit, but usually they are two sentences long, thanking me for coming, as instructed by teachers encouraging good manners. I particularly enjoy the drawings that sometimes accompany them. And there is such a sweet feeling when I open that big envelope and all those thin lined papers flutter out. Still those one of a kind letters from kids who actually read my books are so priceless. Here are a few of my old favorites. Dear Jan Greenberg, I loved your book The Pig-out Blues so much I wanted to eat it. Dear Jan Greenberg, I am a big fan of yours and I tell all my friends to read your books. Can you send me five copies of all of them FedEx? Dear Jan, After I read The Iceberg and Its Shadow, I wrote this poem for you. Roses are Red, Violets are Blue, If I were looking for an author, I’d come straight to you. Love, Sally PS Sorry this is so short, but I have to go to bed now. Dear Jan, Our teacher read Bye Bye Miss American Pie to us. I didn’t like it that much. I hope I can read more of your wonderful books. Dear Jan Greenberg, I love your books, especially the titles. I’ll be coming to St. Louis soon and I plan to stop by and stay with you. My mother says it’s fine if it’s OK with you. That was a hard one to respond to!!! Finally from an eighth grade boy after I visited his class in Warrensburg, MO. Personally I hate to read, but your books are fairly interesting, even though most of them are about girls. I honestly have to admit I expected you to be totally different. I was waiting for an old lady who could hardly walk to hobble in. But wow, then you showed up. In case you’re wondering, I was the dude in the back row wearing a letter jacket. Your Pal, Chris Nelson. PS Usually I fall asleep during that period right after lunch, but you were pretty entertaining. Now why didn’t I get letters like that when I was IN the eighth grade? Ok. The letter is about fifteen years old!!! In the days when I wrote novels, I received many letters from kids. Since I’ve been writing non-fiction, the letters have dwindled. I wonder if those of you who write fiction and non-fiction have experienced that. And these days I get e mails from young people asking me to help write a term paper on POP Art or Jackson Pollock or to send back a three page autobiography for their “Write a profile on an author” assignment. On occasion I suspect that the person e mailing me has never read one of my books. Life was so much simpler before call notes, e mails, and Blackberries. Happy Holidays and a Healthy New Year! My New Year’s resolution is to meet some of you in 2010!!! PS My next blog will be on research. I loved Deborah’s remarks. Deborah Heiligman’s post yesterday inspired me to share my own system of compiling research. 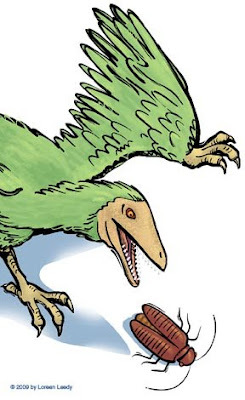 I’m working on a picture book that started with my editor’s suggestion to do a book of dinosaur jokes. In the course of rummaging through books and web sites full of fascinating life forms, the project has turned into a whirlwind tour of life on Earth with poems, jokes, riddles, and fun facts. • Info on the various groups of animals with potential candidates to feature in the book. • An outline of which animals/plants/info/joke/poem could go on each spread. In addition to having to wade through a great deal of information, one of the inevitable problems with prehistory is that the “facts” can change. From what is the tallest/largest/smallest dinosaur to the name of the first horse (bye-bye, Eohippus,) the chances of at least some of the information changing are close to 100%. But hey, updates and corrections what web sites are for. When new fossils are found or old ones are reinterpreted, it’s just part of the progress and self-correcting nature of science. 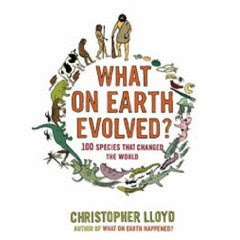 And authors keep writing great books about paleontological subjects. Just yesterday I heard an interview on NPR about this book... haven’t read it yet, but it sounds excellent. A download and transcript of the interview with the author can be found here. Happy holidays to I.N.K. readers! I am starting to do research for a new, big non-fiction book I hope to write. I already have stacks of books and internet resources, though I have more sources to gather, many paths to go down. I love doing research! But there is that moment, right at the beginning, when I get lost and overwhelmed. Everything is so interesting. There is so much to learn. How the heck can I take notes? It happened just yesterday. I was reading an autobiography and panicking. Everything I read I thought, should I write that down? And the answer kept seeming to be yes. I should write everything down. Birth date. Color of father's hair. Mother's maiden name. But if I write down everything, it will take me forty years to finish this book. At least. I tried to stay calm, and just read. I told myself I could always come back and write down the facts that I will need. (And I know I won't forget that her father's hair was red.) So that's what I did. I made a cup of tea, took the book to the couch in my office, and read. I had my notebook with me just in case I couldn't resist writing something down. And then a few pages in something I read hit me in the solar plexus and I said, aloud, "OH WOW!" And then I remembered : I have a system. I do! I have a system! Thank goodness. Seriously, I knew I had system. It's just been a little while. I've developed this system over the years, and it works very well for me. It's very simple: Every time I say "oh wow" I take a note. And I call these notes, yes, my "Oh Wow Notes." Here's an example of a page from notes I was taking while researching Celebrate Halloween. I, of course, don't end up putting all of my "oh wows" into a book, especially not those from the beginning of my research. But as I take notes, I know more what I'm looking for and so the "oh wows" come less frequently. But I know that if something makes me say "Oh wow," it is most likely to end up in a book. And it is definitely worth writing down. When I talk in schools, I tell teachers and children this system. It seems to work for them, too. I modify it a little by saying that you should write down the facts you know you'll need: birth and death dates for people, when important things happened, what those things were, etc. But that the details that will make your research paper (or your book) really sing are the ones you first reacted to that made you say "Oh wow!" I'm sure everyone who writes for I.N.K., and many of you who read I.N.K. have little tricks that make note-taking easier (and even fun). Please share those here so we can all learn from each other. Now this is not my whole system of taking notes. This is just a crucial part of it. In my next few posts on I.N.K. I will share more of my system. As soon as I remember it. Incredible reading experiences, Susan Goodman? Ahhh now, well, as the overarching subject of this blog is nonfiction, I shall not be writing here of the works of Laurie R. King or J.R.R. Tolkein or Jack Finney, but I'm happy to share with whomever reads this the great satisfaction I took in reading The President's House by William Seale, published in 1986 by the White House Historical Association. You wouldn't think that a two-volume doorstop would be so wonderfully readable. I came across it when I was researching my Ghosts of the White House (Simon & Schuster, 1998), in which the departed Presidents are spooking about the place all at once, talking to a young visitor (modeled on my niece, Sara, who accompanied on my research trip to the W. H.) about their administrations. I continue to be knocked out by the notion of all of these very different individuals and their families all living - often under terrific strain - within those same stone walls. And too, each of those gents represents a different chapter in the story of the Republic. Mr. Seale's book is a lively history of the building itself, including, its inhabitants, of course. I adore finding out that a certain "Hugh Densley" spent the early spring of 1799 covering the walls of the President's House with plaster made up of "large quantities of plater of Paris, fine washed sand, lime, olive oil, beeswax, and 400 bushels of hog and horse hair, all of which Hoban [James Hoban, the architect' had bargained for in Baltimore." I love knowing [I also loathe knowing this, considering the lot of the poor in1880s America] that President Chester Arthur traveled about Washington D.C. in an English-style carriage, a "landau, lacquered green and red, with his coat of arms painted on the door in gilt. The coach lamps were silver-plated...the coachman and the footman wore 'mouse color' livery with silver buttons.' Ooooh baybee - who needs fiction? "Let us tenderly and kindly cherish, therefore, the means of knowledge. Let us dare to read, think, speak, and write." Amen. It’s that time of year when a person’s mind drifts to…presents. In these strange, hard times—economic and otherwise—how about giving a gift to yourself, one that keeps on giving? Take a moment to remember a book that blew you away. Since I’m a nonfiction writer and this is a blog about nonfiction, I figured I should/would come up with a nonfiction example. But The Things They Carried, Tim O’Brien’s great book about soldiers’ experiences in Vietnam and war in general, popped into my mind even though the story is a weird mix of fiction and nonfiction. I haven’t read The Things They Carried since it came out about 20 years ago. I couldn’t tell you many specific events that happened in it, but I’ll never forget two things. Every second of reading that book made you feel intensely alive. And, even when O’Brien made something up, it had the ring of truth. Actually this was one of his major points—that facts and truth aren’t always one and the same. As a nonfiction writer, am I getting myself into trouble here? Am I advocating Stephen Colbert’s “truthiness?” Or unconsciously trying to convince myself that I can bend the facts in the book I’m writing to create a better effect, a deeper truth? Nah. The Things They Carried was a profound book, I recommend it to all. In terms of nonfiction, it helped me realize that you can’t rely merely on facts to tell the Truth, but when you have both of them in one place, that’s a place you want to visit. Okay, that’s one of my incredible reading experiences. What’s one of yours? One summer when I was about seven or eight, my parents sent me to camp. Every morning I’d board a bus full of kids I didn’t know and hunker down for the long ride (made longer by the fact that I always got carsick). Each day was filled with activities that seemed—even then—to be designed to kill as much time as possible. Then we’d all climb back on the bus for the long, hot, queasy ride home. The highlight of the summer was supposed to be the overnight stay, where we’d get to sleep in tents without our parents and have lots of fun. I quietly confessed to the bus driver—a guy in his thirties who seemed to be having as lousy a time as I was, but at least he was getting paid—that I didn’t want to go. I didn’t like bugs, I explained. At which point, in front of the whole bus full of kids, he whipped out a can of bug spray, said something snarky, and all the kids laughed. And so, I did the overnight stay. I don’t remember the ‘lots of fun’ part, but do vividly remember the tick check we all had to submit to the next morning. That may have been the worst kind of camp, but I’ve just returned from the best kind—a retreat, really, where I felt pampered and cared for, met great people, and spent days engaged in activities so interesting it made me wish the days were longer. Plus, there were no bugs! I joined my buddy Kim T. Griswell, an editor for Highlights, Inc. and Boyds Mills Press, to teach a four-day workshop on narrative nonfiction. The workshop was held in a beautiful old farmhouse near Honesdale, PA (home of the Highlights editorial offices.) The participants stayed in cute private cabins with lovely wood floors and cozy quilts on the beds. The food was wonderful—fresh and healthy and delicious. There was time for discussion, time for work, and time for hanging out with a glass of wine or a warm cup of tea. We even had guest authors and editors who came for dinner and shared their thoughts on writing. I loved meeting so many people who are as passionate about writing nonfiction as I am, and I left Honesdale already looking forward to going to ‘camp’ again. Kim and I won’t be teaching our class again until 2011, but there are plenty of other workshops offered next year, including two on writing nonfiction. Check ‘em out. Best. Camp. Ever. For a forthcoming picture book biography, I did the same amount of reading. I visited my subject’s hometown and the town where she lived most of her married life. I ordered microfilms of her papers from her state historical society and had them delivered to a nearby public library where I squinted and printed decades of her handwriting. My first draft of the book came in at 7100 words. Draft #2 was 2400 words. Draft #6, the one I sold, had slimmed down to 1232 words. Just like losing those last five pounds, the last draft was hardest to write. • I figured out what my story was about. • I decided which parts of her life illustrated what I wanted to say about her. • I ruthlessly expunged all kinds of wonderful details that didn’t enhance that story. The advantages of writing longer is, of course, that I could include more of those wonderful details. I could bring in a larger cast of characters. I could quote more of a vitriolic tirade between my subject and a longtime friend. I could talk about her brilliant brother and how he went mad. I could discuss and quote more of her writings. I could talk more about her children and their tragedies and her grief. I could discuss her friendships with women and what that showed about her era. What did I gain by choosing to write a shorter picture book? I could use a livelier voice and more colloquial language. This works better in a short form than it would in a more detailed and documented treatment of her life. And of course, I’ll have pictures to help me tell the story, describe the setting, and create an atmosphere. Congratulations to our bloggers Deborah Heiligman(Charles and Emma: The Darwins' Leap of Faith) and Steve Jenkins (Down, Down, Down. A Journey to the Bottom of the Sea) for their selection as one of the eight titles chosen by the New York Times as the most Notable Children's Book of 2009! Here are some recommendations for other excellent children's nonfiction. Tis the season to buy nonfiction! 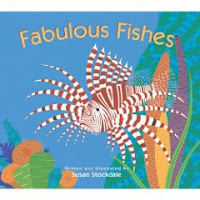 Fabulous Fishes, written and illustrated by Susan Stockdale. (2008, Peachtree Press, $15.95 hardcover) This charming picture book features simple rhyming text ("Shiny fish / spiny fish/ fish that hitch a ride") and bold, colorful pictures that introduce kids to all sorts of fishes. A spread at the back of the book gives more information about the fish included in the book. 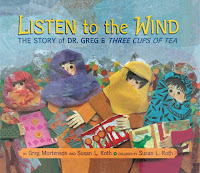 Listen to the Wind: The Story of Dr. Greg & Three Cups of Tea, by Greg Mortenson and Susan L. Roth, illustrated by Susan L. Roth. (2009, Dial Books for Young Readers, $16.99) I enjoyed Mortenson's Three Cups of Tea, but I love the way Susan Roth retells this true story through the eyes of the Pakistani children. Her stunning paper-and-fabric collages take my breath away. 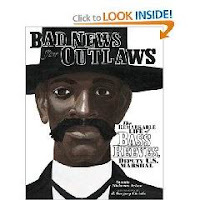 Bad News for Outlaws: The Remarkable Life of Bass Reeves, Deputy U.S. Marshal sports the longest title and the most stunning cover I’ve seen this season. Gregory Christie’s monochromatic close-up headshot of Reeves is riveting. Christie continues with atmospheric endpapers and many full-page paintings which fit this monumental subject. Vaunda Micheaux Nelson’s colloquial text is also a perfect fit for a man who lived a most dramatic life. Slave, runaway slave, sharpshooter, and wily master of disguise, he became the first African American U.S. Deputy Marshal and served for thirty-two years. Nelson recounts several wily nonviolent captures by Reeves who brought more than 3000 outlaws, including his own son, to justice. The only quibble I have with this exciting story is the opening scene. Though Reeves killed only fourteen men out of 3000, Nelson opens with a thrilling but deadly confrontation with one of the fourteen victims. As an old peacenik, I would have preferred to see him outsmart rather than outshoot his man in the opening pages. I first began my extensive collection of children’s books when I was a young illustrator and well before I began to write books on my own, so I used to select each book based solely upon the quality of the illustrations. 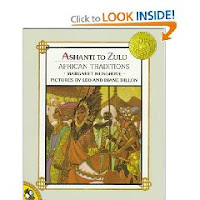 One of my favorite early choices was the nonfiction book Ashanti to Zulu: African Traditions. This Caldecott Award Winner was first published in 1975, and the artwork looks every bit as good today as it did way back then. Written by Margaret Musgrove and stunningly illustrated by the indefatigable husband-and-wife duo, Leo and Diane Dillon, it’s a classic alphabet book that intrigues its readers by introducing them to 26 exotic African tribes. The Dillon’s elegant layouts and their gorgeous, richly colored, and well researched portrayals of the African people taught me how pivotal the illustrations in a book can be. As it turns out, the writing is charming too. 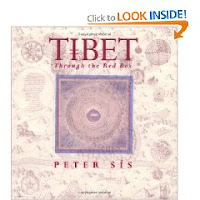 My second nonfiction choice is Tibet: Through the Red Box by Peter Sis. In this 1998 Caldecott Honor Book, Sis finds a mysterious red box, and upon opening the lid with a rusty little key, he discovers the diary his filmmaker father had written when he was lost in Tibet years before. Once again, it’s the magically symbolic artwork that draws readers into this exotic tale, sweeping readers back an forth in time on each otherworldly spread. The pictures I’ve included here are a pale shadow of the glorious ones in the book, so I invite you to have a real-world look for yourself. From Tanya Stone: Bring Me Some Apples and I'll Make you a Pie: A Story Abut Edna Lewis by Robbin Gourley and Cycle of Rice, Cycle of Life: A Story of Sustainable Farming by Jan Reynolds. Jan's passion shines through on every page--as always. From Susanna Reich: I'd like to recommend The Race to Save the Lord God Bird, by Phillip Hoose, a beautifully written, meticulously researched, and gripping book about the extinction of the ivory-billed woodpecker. From Susan Goodman: I really like Steve Sheinkin's clear, fun, irreverent but accurate approach to history. Possible titles--King George: What Was His Problem? and Two Miserable Presidents: The Amazing, Terrible, and Totally True Story of the Civil War. David Elliott's poetry reduces familiar animals to their essence and makes us think in On the Farm, illustrated beautifully by Holly Meade's woodcuts. Barry Denenberg's Lincoln Shot: A President's Life Remembered--what a great idea. I wish I had it! Fantastic NF books to inspire creativity this holiday season:Touch the Art: Catch Picasso's Rooster (Board book)By Julie Appel (Author), Amy Guglielmo (Author)Sterling November 2009Best book yet in the series. Includes my fav, Franz Marc!365 Things to Draw and Paint (Art Ideas)By Fiona WattUsborne Publishing Ltd October 2009. This book would have kept me busy the entire Winter Break. Full of ideas to inspire hours of drawing fun because kids always moan, "But, I don't knowwhat to draw. "What's the Big Idea? : Inventions that Changed Life on Earth ForeverMaple Tree Press November 2009Helaine Becker (Author), Steve Attoe (Illustrator)New, fun book that shows kids that their ideas can change the world. From Vicki Cobb: I've become a big fan of Nic Bishop. He is a gifted and obviously VERY PATIENT wildlife photographer who brings his considerablt gifts to dramatic and beautiful portraits of Spiders (Scholastic, 2007) and Marsupials (Scholastic, 2009). Speaking of animal books, I was also very impressed with Face to Face with Penguins by Yva Momatiuk and John Eastcott (National Geographic 2009). Again, the beautiful photographs can't help but make you fall in love with these amazing creatures and worry about their surviving a future of global warming. That message will not be lost on its readers. From David Schwartz: The Librarian Who Measured the Earth by Kathryn Lasky, ill. by Kevin HawkesWho would think that the deeply mathematical tale of Eratosthenes could be so captivating and charming, even for math phobes? And while we’re at it, we learn about schools and libraries in Ancient Greece. Splendid! A Million Dots by Andrew Clements, ill. by Mike ReedThe idea of seeing a million of something fascinates many children (and this reviewer/author since childhood) and here is your chance! But it’s much more than a gridwork of dots. There are facts galore tied in with the numbers and fun, fun, fun on every colorful page. My dad will be 90 years old on December 8. To celebrate, we’re having a big party this Sunday, commemorating the milestone with excellent food, good cheer, and even a surprise or two. My brother, a one-time stand-up comedian, will be master of ceremonies at the festivities. Not surprisingly, my contribution will be providing the historical context. A few years ago, for my parents’ 50th anniversary, I created mini-magazines with pictures, short articles, and even a few puzzles about their life together—no doubt a reflection of my many years as an editor of Scholastic’s classroom magazines. This time, having just completed the back matter for an upcoming book, I decided to apply one of the go-to standards of nonfiction back matter to my dad’s life—the timeline. Since I wanted this timeline to make a visual statement as well as an emotional one, I started by searching for software that would enable me both to organize events and import pictures. I found a few different programs, designed for business presentation purposes but adaptable for personal use. I took the plunge and bought one, then started working on the content. It turns out that despite knowing my dad for 55 years, I could not pinpoint as many defining moments and turning points as I thought. So I doggedly pursued the details of his life as I had those of Annie Oakley and Nellie Bly before him, poring over scrapbooks and photo albums and turning every visit to my parents’ home into an oral history session. I learned volumes. For instance, my dad, who helped found one of the biggest accounting firms in New Jersey, got his start in business at age seven, when his older brother “forced” him to sell copies of Collier’s magazine for five cents door-to-door. He turned 13 in the midst of the Great Depression, so he celebrated his Bar Mitzvah with a party at home; he said his best gift was a $2½ gold piece. (Who even knew there was such a thing?) In the 1950s, both of my parents campaigned for Adlai Stevenson; they’ve got a letter signed by Stevenson thanking them for their support and a souvenir ticket to one of his rallies. Later in the decade, my dad continued his commitment to civic affairs by serving on the Citizens Advisory Zoning Committee in our town and the Citizens Planning Association for the area. When I write biographies, I start with a subject who had an impact on society and use every available resource to try and learn more about who that person was. Working on my dad’s timeline, I went in the opposite direction. For most of my life, I’ve seen my dad from the context of our family, from my particular perspective as his older child, his only daughter. But looking at his accomplishments all mapped out on a colorful timeline helped me get a clear sense of his place in the world beyond our front door. What a great learning experience. What a great man. How Do Teachers Use Our Books? I'm a special education teacher for grades 3-5. I primarily work with 4th and 5th graders, teaching reading, writing and math in "core replacement" groups. Explanation: all of our 4th graders have reading at the same time, so the group I have is getting "core replacement" in my room at the same time their peers are being taught reading in the general education classroom. Same with math, writing and 5th grade reading. My school also has a literacy teacher (for students who are doing a bit better than mine academically) and a Title 1 reading teacher. What kind of reading assignments do you give kids? In class, we all read the same story/book together. Sometimes, I'll let the kids read silently to themselves or in pairs, but this is usually not very effective because of their lack of reading skills. How important do you feel it is for every kid in your class to read the same assignment on a topic? For my kiddos, this is very important. This way, I can be assured they are reading correctly, and we have wonderful discussions to ensure comprehension of the material. Most of my kids are way better verbally! Have you ever gone to the library and looked for books on the content you have to teach? Honestly - I usually hit half.com or ebay first. I like to purchase books with my own money, then I'll have them for the next years! I have quite a collection of books in my classroom and like to have them "at my fingertips" to pull for kids! Have you ever used a trade (library) book on a subject covered by your textbook instead? Yes. If so, why? Usually because the story provided in the book I'm required to use doesn't go "in depth" enough about the subject. Also, I like to show my students that each and every book about a subject can offer different/additional information! For instance - my students are stunned to know that I personally own more than 50 books about Lewis and Clark. How closely do you coordinate what you are teaching with your school librarian? Honestly, not much. Our school library is pretty limited, although our new librarian this year has consulted with me to order more non-fiction books at a reading level my kids could handle! Yay!Does she pull books for you? I know she would if I asked. Does she come to you or do you go to her? We've done a bit of both this year. Do you find ways to have kids read different books on a topic and share their experiences in class projects and discussions? Yes. If so, what are your strategies? My students are given a "book bag" each week with a small book in it to read at home. I try to coordinate these books with what we are reading in class. It's fun to watch them make the connection! How proficient do you feel in your knowledge of children's nonfiction literature in the subjects you have to teach? Pretty good. But, I must admit, my association with Cheryl Harness has really provided me with so much more knowledge about good non-fiction for students! She's kind of "adopted" my students during the past few years, and is always willing to answer their questions (they love that a real author writes to them!) and mine as well. She's pointed me to many books, websites, etc., to help expand my kids' knowledge. Would you find professional development by authors in this area useful? I think that would be great! I love to learn new things, especially when I can pass information along to my students and make learning more fun for them! In my position as a special education teacher - I don't think it's enough to just teach a child to read. My students may always struggle with reading, so I feel it's important to instill a LOVE of reading in them! If they're interested, engaged and excited about reading - then they will read! I've learned that non-fiction is the best way to get my students excited - more so than talking animals and fantasy. Thank you, Susan! If you would like to respond to my questionnaire, you can find it here. Email it to me as Word attachment and I’ll post results next month. By the way, Ink Think Tank, LLC, our new company that has come out of the blog, is getting ready to offer exactly this kind of professional development to teachers via videoconferencing. Stay tuned.